Meyerson naevus (also referred to as halo dermatitis, halo eczema and Meyerson's phenomenon) is a mole (melanocytic pigmented nevus) characterized by the development of an eczematous area around it. 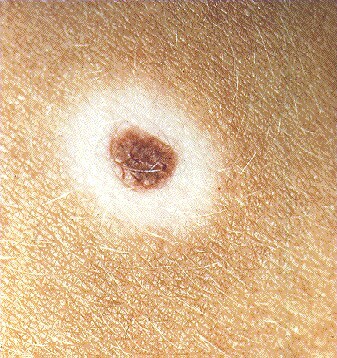 The nevus has regular borders and uniform color. 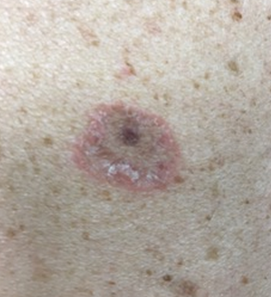 Clinical features are the erythematous halo with desquamation most often accentuated at the periphery of the red zone with the centrally positioned nevus. Sometimes patients suffer of a slight pruritus. Usually solitary, can be multiple. 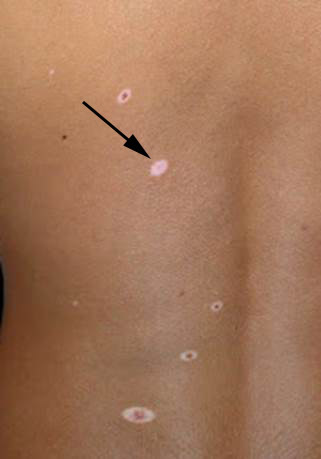 Meyerson L.B, an United States dermatologist, first described the condition in 1971 (two men with benign melanocytic naevi surrounded by eczema). Meyerson naevus affects usually young males, three times as common compared to females. But older people may have it. It may occur in patients with atopic conditions but it most often occurs in healthy individuals without any pre-existing conditions. 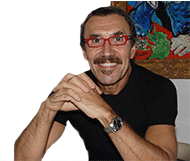 The cause of Meyerson naevus is not known. It was suggested that it may be the result of immune cells reacting against antigens on the surface of the naevus cells. The eczema usually resolves spontaneously within a few weeks or with a topical corticosteroid cream. 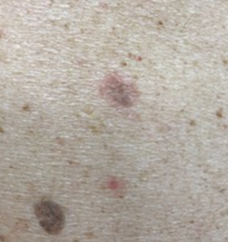 Meyerson nevus is different from Sutton nevus in which the nevus is surrounded by an area of hypopigmentation, usually of uniform width at all points. Furthermore the lesion in the center of a Meyerson naevus never changes or fades away even when the surrounding eczema has resolved. 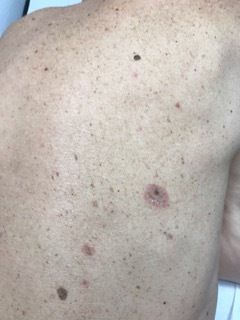 In contrast, the central mole of a halo mole usually fades in colour and eventually disappears altogether (arrow in last picture).